Source: Picturesque Palestine, vol. 1, p. 43. 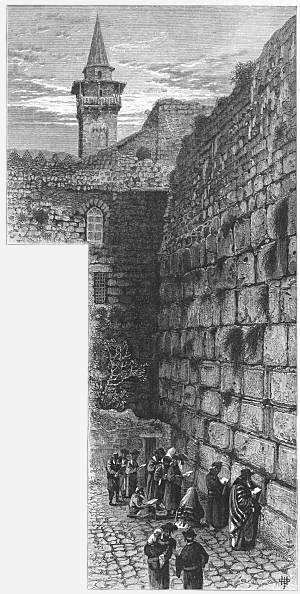 North of “Barclay’s Gate” is the well-known Wailing-place of the Jews, a small paved area in front of a portion of the retaining wall which is supposed by some writers to be the nearest point, without the enclosure, to the position of the “Holy of Holies.” The pavement is at least seventy feet above the natural surface of the ground. Jews may often be seen sitting for hours at the Wailing-place bent in sorrowful meditation over the history of their race, and repeating oftentimes the words of the Seventy-ninth Psalm. 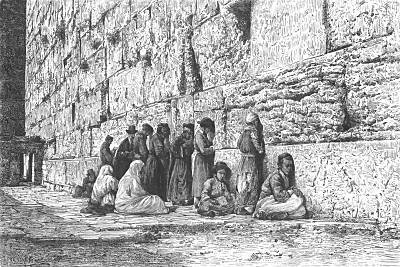 On Fridays especially, Jews of both sexes, of all ages, and from all countries, assemble in large numbers to kiss the sacred stones and weep outside the precincts they may not enter. (Source: Picturesque Palestine, vol. 1, p. 41). Source: Picturesque Palestine, vol. 1, p. 72. It is a small paved quadrangle; on one side are the backs of low modern houses, without door or window; on the other is the lofty wall of the Haram, of recent date above, but having below five courses of beveled stones in a good state of preservation. Here the Jews are permitted to approach the sacred inclosure, and wail over the fallen Temple, whose very dust is dear to them, and in whose stones they still take pleasure. . . . Some were on their knees, chanting mournfully from a book of Hebrew prayers, swaying their bodies to and fro; some were prostrate on the ground, pressing forehead and lips to the earth; some were close to the wall, burying their faces in the rents and crannies of the old stones; some were kissing them, some had their arms spread out as if they would clasp them to their bosoms, some were bathing them with tears, and all the while sobbing as if their hearts would burst. It was a sad and touching spectacle. Eighteen centuries of exile and woe have not dulled their hearts’ affections, or deadened their feelings of national devotion. (Source: Jerusalem, Bethany, and Bethlehem, pp. 39-40). Source: Jerusalem, Bethany, and Bethlehem, p. 41. On certain occasions, towards evening, the following litany is chanted. 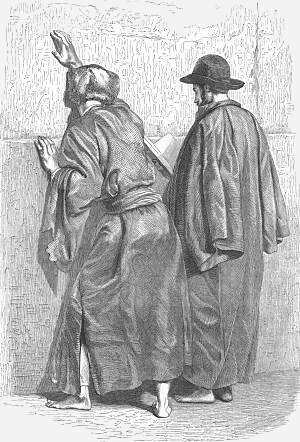 The accompanying engraving represents two Jews chanting. Leader: For the palace that lies desolate:—Response: We sit in solitude and mourn. L. For the palace that is destroyed:—R. We sit, etc. L. For the walls that are overthrown:—R. We sit, etc. L. For our majesty that is departed:—R. We sit, etc. L. For our great men who lie dead:—R. We sit, etc. L. For the precious stones that are burned:—R. We sit, etc. L. For the priests who have stumbled:—R. We sit, etc. L. For our kings who have despised Him:—R. We sit, etc. Leader: We pray Thee, have mercy on Zion!—Response: Gather the children of Jerusalem. L. Haste, haste, Redeemer of Zion!—R. Speak to the heart of Jerusalem. L. May beauty and majesty surround Zion!—R. Ah! turn Thyself mercifully to Jerusalem. L. May the kingdom soon return to Zion!—R. Comfort those who mourn over Jerusalem. L. May peace and joy abide with Zion!—R. And the branch (of Jesse) spring up at Jerusalem (Source: Jerusalem, Bethany, and Bethlehem, pp. 40-43). Source: Earthly Footsteps of the Man of Galilee, p. 238. Against the southwestern wall of the temple area a paved space is given to the Jews, where they may pray and read from their prophets and wail out their woe under the very shadow of the area on which once stood the pride of this nation, the temple of God. On Friday afternoon, March 13, 1863, the writer visited this sacred spot. Here he found between one and two hundred Jews of both sexes and of all ages, standing or sitting, and bowing as they read, chanted and recited, moving themselves backward and forward, the tears rolling down many a face; they kissed the walls and wrote sentences in Hebrew upon them. One of the words most frequently written is the simple word, as translated in English, "Hoping." The lamentation which is most commonly used is from Psalm 79: "O God, the heathen are come into Thy inheritance; Thy holy temple have they defiled; they have laid Jerusalem on heaps. We are become a reproach to our neighbors, a scorn and derision to them that are round about us. How long, Lord? Wilt Thou be angry forever? Shall Thy jealousy burn like fire?” (Source: Earthly Footsteps of the Man of Galilee, p. 147). 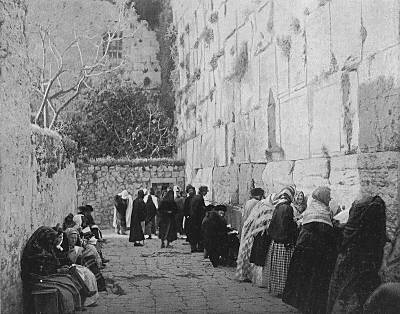 See the Wailing Wall in the 1960s or visit it as it is today. Or see the Temple Mount or Old City Gates as they used to be.